Hey all! Here's the November 1st Q & A! 1.) 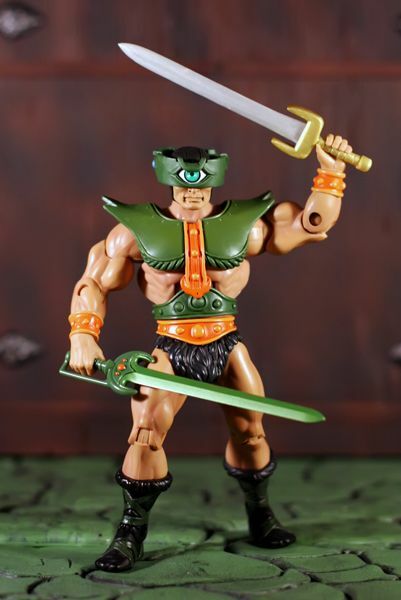 Since it seems like there is some sort of loophole in the 1987 MOTU movie rights that allows you to make accessories based on the props used in the film (Adora's handgun, Captain Glenn's rifle, the Cosmic Key), is there any chance that we may eventually see a film-inspired power sword included in the MOTUC line? It might be possible but it isn't something we are in a rush to do. The guns were more of an Easter Egg then a loop hole! 2.) 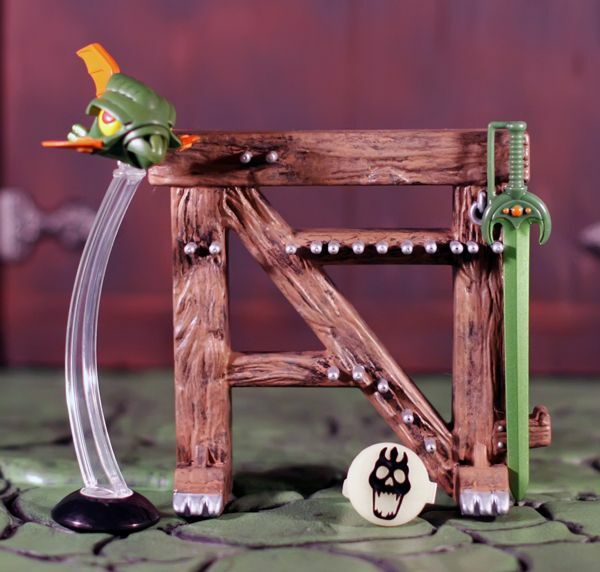 The inclusion of the Alcala Skeletor head with Demo-Man is quite a treat and is a very clever means of getting fans this much-requested item without forcing another Skeletor purchase on us. 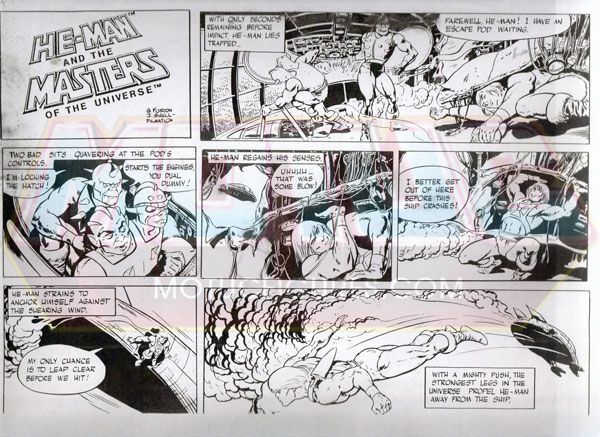 Is it possible that we may see this sort of pack-in again in the future (i.e. including a head meant for another character)? 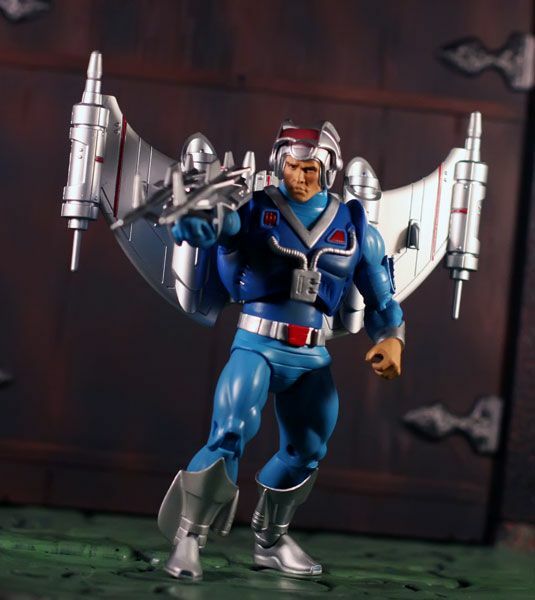 Yes, our long term plan has always been to throw in these type of items to hit fan demanded requests without making fans buy extra figures. 3.) 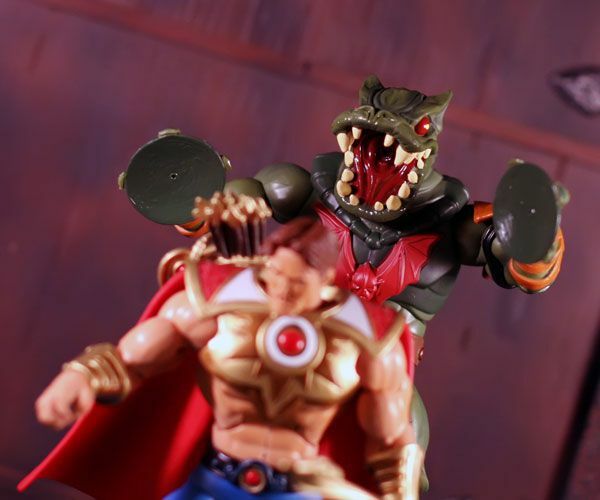 After Toy Guru's recent statements about He-Man.org's relelvance to the MOTUC fanbase (i.e. 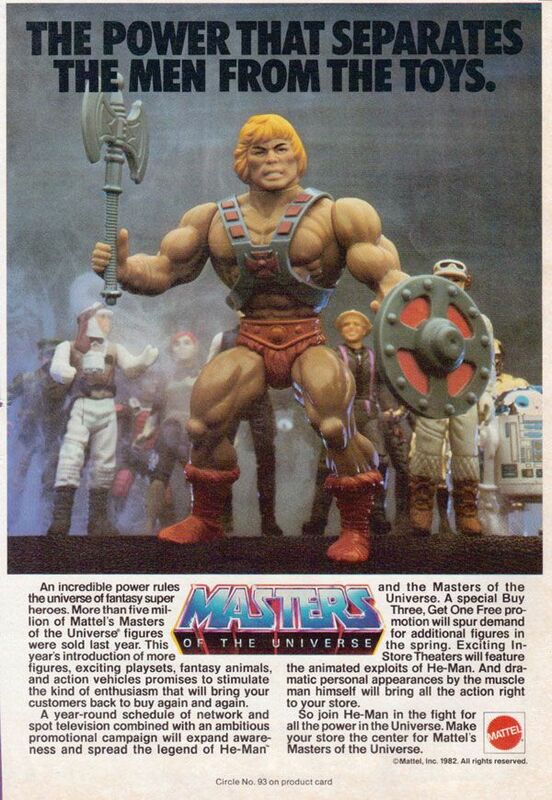 saying things like "the small passionate He-Man.org "bubble" -with about 200 posters and 50 of which post regularly"), I just wanted to ask if you were aware of the actual numbers behind He-Man.org? 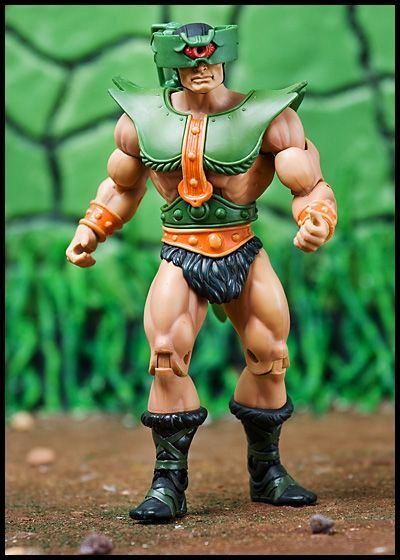 He-Man.org has over 8000 registered members. Out of those, between 1000 to 1500 log in each day, with an additional 4000 to 5000 guests also visiting and viewing the forums daily. 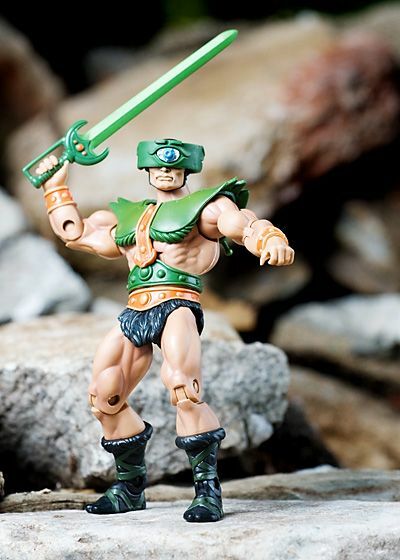 Unlike other forums, He-Man.org also purges inactive accounts, so the majority of their 8000 registered users are actual regular users. 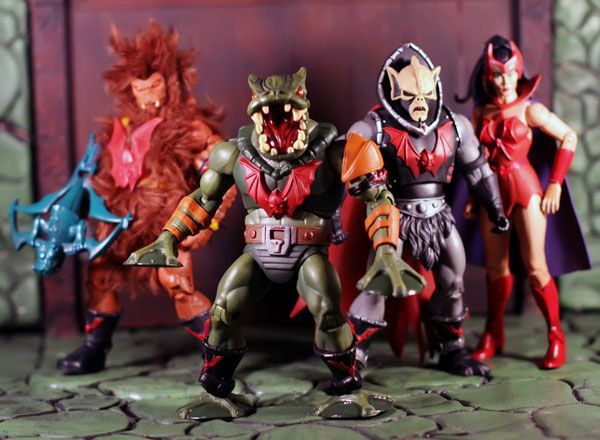 Given the statements in the past that the MOTUC line is done on very small numbers, it would seem that trivializing this amount of the fan community was a fruitless move. 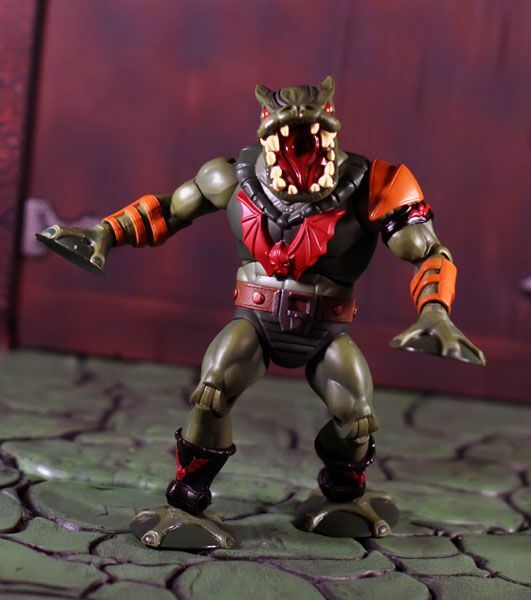 Does Mattel as a whole view He-Man.org as such a small portion of the fanbase when they see these numbers in comparison to the overall number of MOTUC sales (especially when this is the "lowest-selling" sub yet)? "Hey guys, I meant no offence at explaining this. All I was attempting to do we manage expectations as to why we might not be able to hit certain fan requests that come up a lot simply because there is a difference in something being requested by a large number of fans vs something requested by a small number of fans over and over. 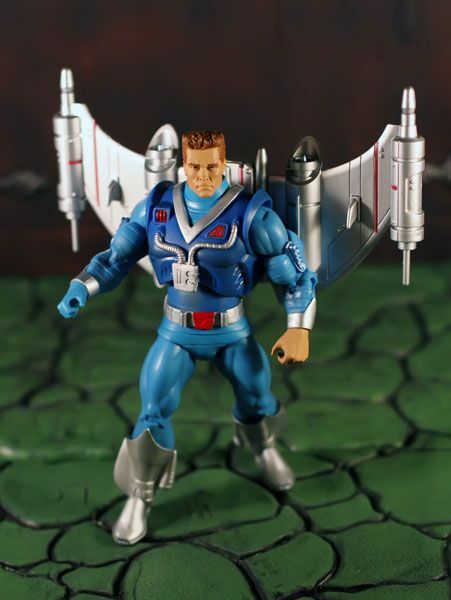 It is very similar to the JLU line on a site like Actionfigureinsider.com. The fans there are extremely passionate but we know from sales data as well as manual counts of posters within a 30 day period that it really is the same small group that post over and over. The internet has a way of giving everyone a voice which can be a lot louder then it is accurate in terms of the total fan base. 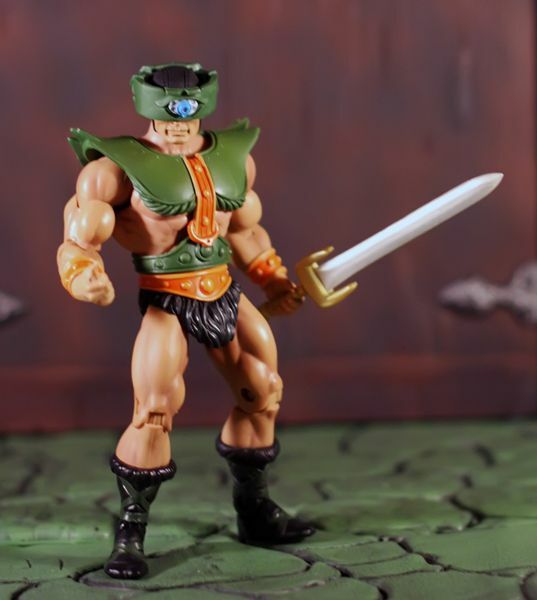 Personally I have nothing but respect for all of the fan sites and He-Man.org is a GREAT site to chat MOTU." 4.) 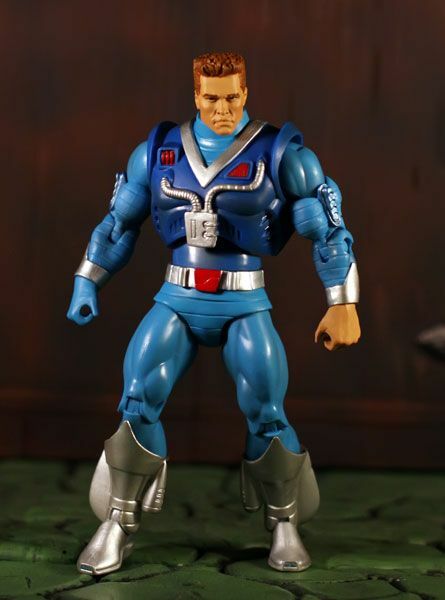 This one's just for fun- What's the consensus over at Mattel- Does Icarius look more like Val Kilmer or Arnold Schwarzenegger? My money is on Kilmer. "Personally, I also think a little Val Kilmer, but it is all Icarius!" No. Alas we did not have a budget for a forth comic. Since fans are getting these at zero additional cost, it really is a bonus and not something we can include with every figure. A great pilot from the cloud city of Levitan on planet Primus, Icarius is equipped and ready to “flip” into battle at a moment's notice. After his 18th birthday, he left home to join the Galactic Protectors. 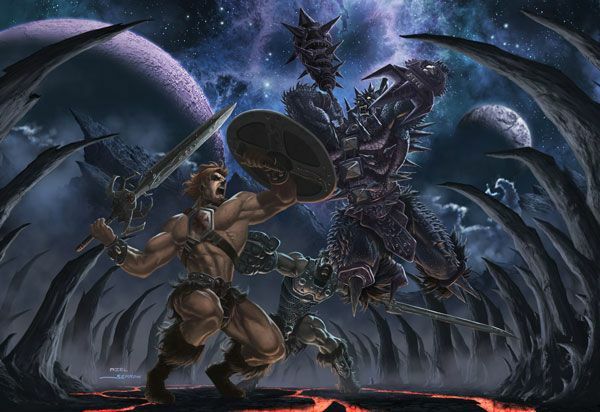 Rising to the rank of Lieutenant, Icarius traveled with Captain Hydron on his quest to find the legendary twin warriors prophesied to defeat the Horde Empire. 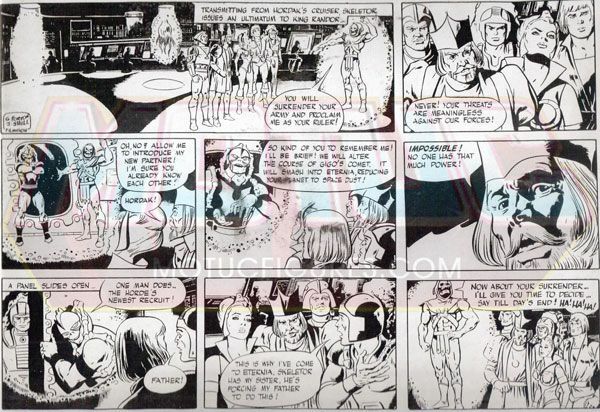 Arriving on the distant planet Eternia shortly after the end of the Second Ultimate Battleground, they recruited not only He-Man and She-Ra, but several other Masters of the Universe who were eager to pursue Skeletor to the stars. 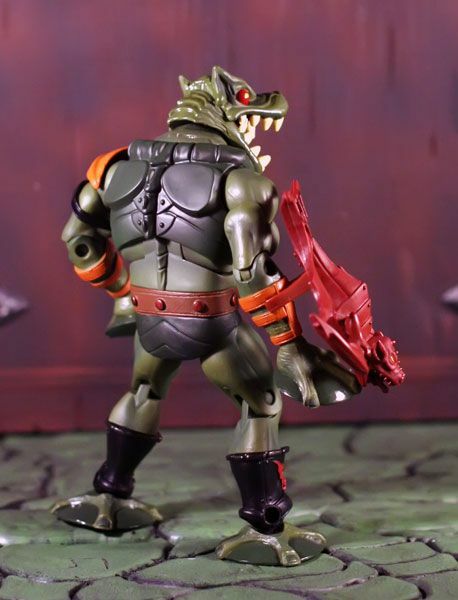 Nicknamed “Flipshot,” Icarius utilizes a battle helmet, back mounted jet pack and concussion grenade wrist rockets in battle against Skeletor and his new Space Mutant army. 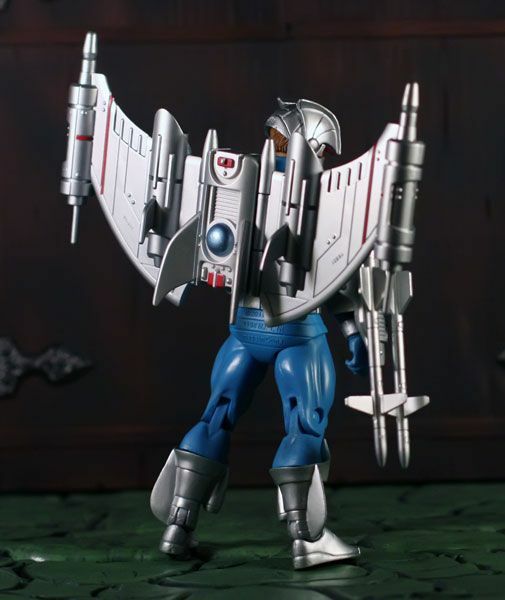 Accessories: Jet Pack, Wrist Mounted Missile Launcher. 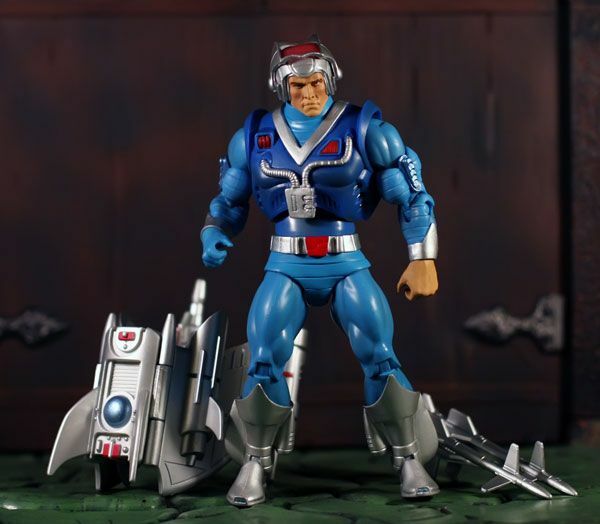 Additional Parts: Icarius also includes an additional "unhelmeted" head. 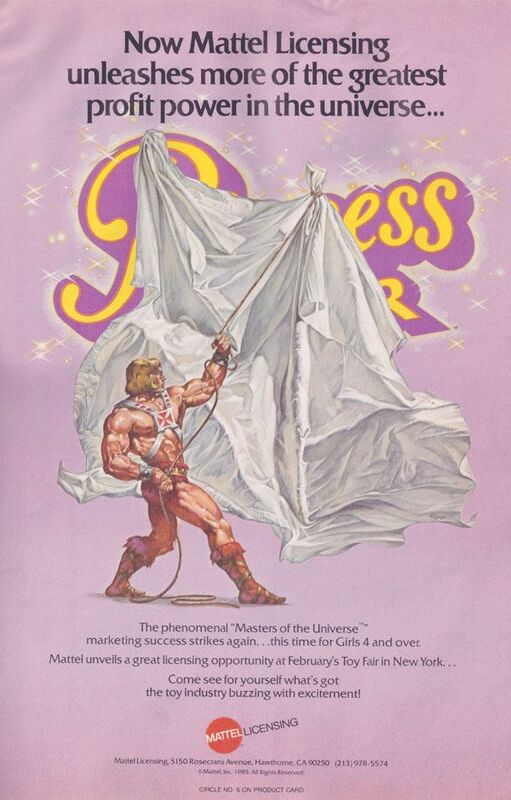 Up today- A Mattel licensing ad featuring the "unveiling" of the Princess of Power line! 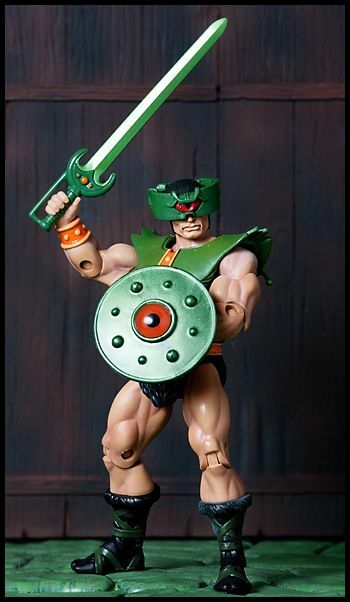 A war rages across Eternia... Friends turn into foes as 64 warriors clash in an epic confrontation across time and space... Only one shall survive in... THE ULTIMATE BATTLEGROUND! Have you ever filled out one of those "March Madness" bracket ballot things? You know the kind... where you pick winners in each round of a tournament and whoever has the most correct guesses at the end gets some sort of prize? 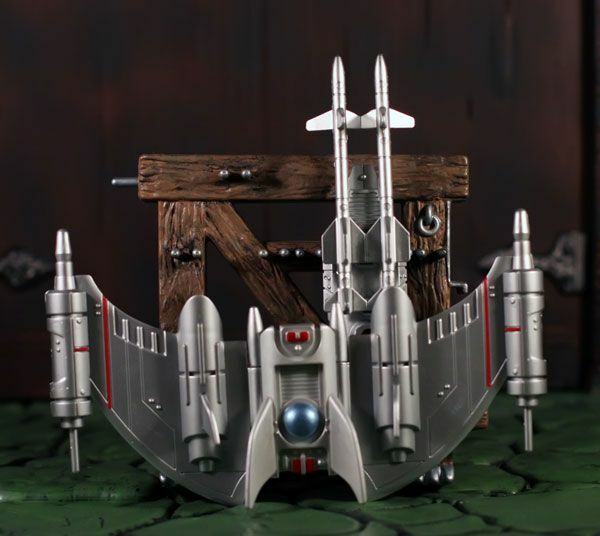 Well, since I've never been into sports, I've always had to admire that game from afar... until it dawned on me that the principles of this guessing game could be applied to something I actually do like: MASTERS OF THE UNIVERSE CLASSICS! So I chose 64 characters, threw them all randomly into 32 fights, created a spreadsheet around it and voila... "THE ULTIMATE BATTLEGROUND" bracket was born! So here's where you all come in... 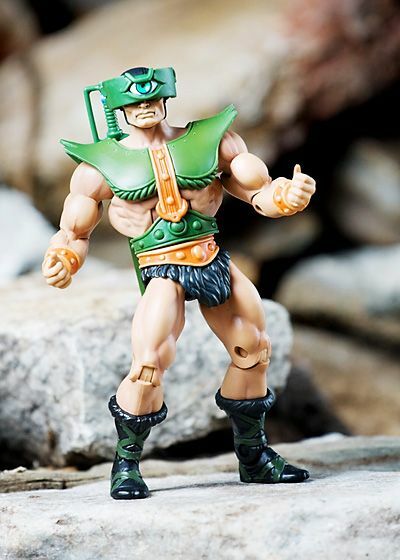 I'd really like to see a bunch of people involved in this thing, getting together and tracking the winners and so forth... so to get the ball rolling for this first endeavor I'm offering not one, but TWO MOTU Classics figures to the participant who walks away with the most points at the end of the game. Which 2 figures are they you ask? Well none other than guy-with-three-eyes TRI-KLOPS and the man of many faces MAN-E-FACES! I like to call it the "prize with a lot of eyes"! Ha! 1.) Shoot me an e-mail at theultimatebattleground@hotmail.com with the subject "Ultimate Battleground Entry" in the subject line, then watch your inbox for a reply with a couple of excel spreadsheets attached. One of these will be your entry bracket that you'll need to fill out and return to me NO LATER THAN NOVEMBER 15th! 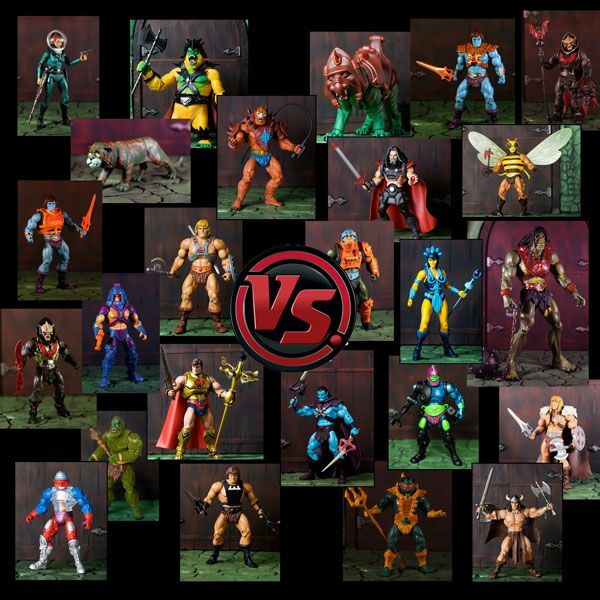 "Round 1" of the bracket is already filled out, with 64 MOTUC characters paired up randomly in 32 bouts. You'll need to pick who you think will win these pairings and insert those names into the 32 boxes listed under "Round 2". For every one of these that you guess correctly, you'll get 1 point. Next- fill out your guesses as to the 16 winners of the 32 bouts from "Round 2" into the 16 empty boxes listed under "Round 3". Correct answers in Round 3 are worth 2 points. Then choose the 8 winners of those fights and place them under "Round 4"... right answers here are worth 4 points. Narrow that down to 4 winners placed under "Round 5". Get any of those right and you'll get 8 points a pop. Next, choose 2 winners from the fights in "Round 5" to plug under the "Round 6" column. Correct answers in "Round 6" give you 16 points each! Lastly, choose your overall winner and plug him or her under the "Winner" column. A right answer there gives you a whopping 32 points!!! (Don't worry if you didn't get all of that! An example sheet will also be included with my reply e-mail). 2.) When deciding the winners for each bout, keep in mind that the victor is chosen totally at random! 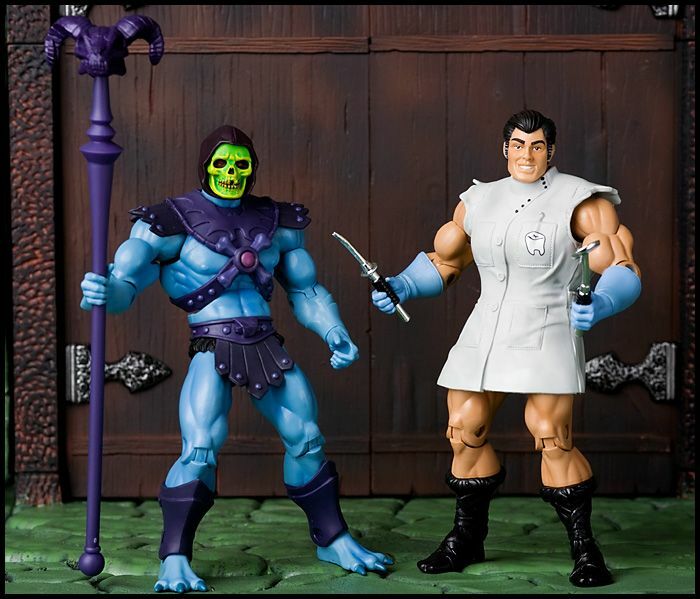 So just because Skeletor would trounce Stratos in a fight ordinarily, doesn't mean that he will win the coin toss that decides the winner of the bout in this contest! Random chance gives everybody an equal opportunity to win... So when you see your boy Cringer going up against Faceless One- Don't panic! He could easily win that coin toss! So if you want to keep track of your ballot every step of the way, be sure to follow us at all 4! If you don't want to do that, the winner will be notified by e-mail when the tournament ends... But I really hope you'll follow along! That's half the fun! 4.) 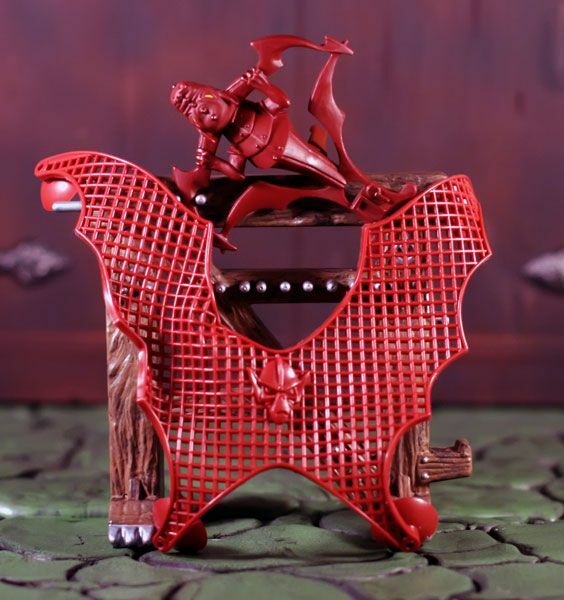 A winner will be announced and contacted via e-mail once the tournament has ended. In the event of a tie, a winner will be chosen by random amongst the equal top scores. I hope you guys and gals will participate in this and that it's something we can do on a recurring basis. Thanks! I'm not sure if you know this or not... 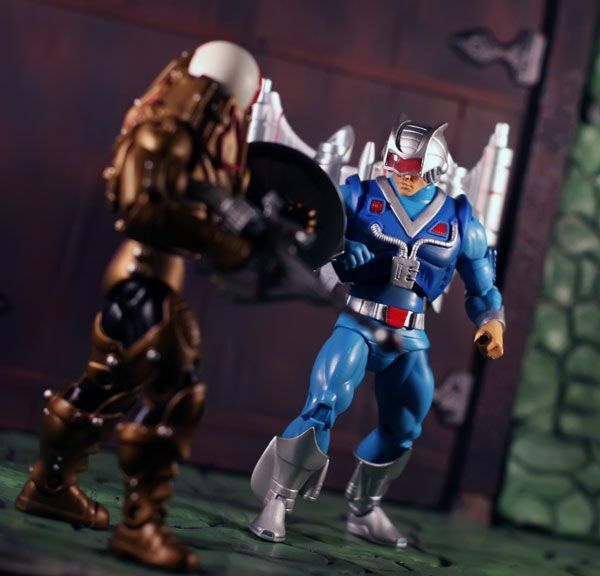 But I wasn't a fan of the Mo-Larr Vs. Skeletor pack. 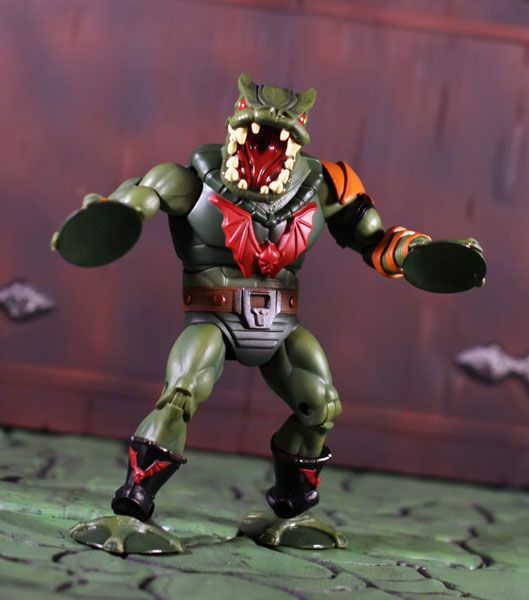 A figure set based on a 2 minute skit from Robot Chicken (a show I don't even watch)? Um, no thanks. I felt that it was a waste of time and tooling dollars. In fact, I pretty actively expressed my disdain for it whenever I could. Well... I'm sorry. I'm sorry about all that. Because today? Today Mo-Larr saved the day. I owe him one. Rewind to this past Wednesday. My youngest son Keaton (who is quite the bruiser) was getting into his usual rough and tumble business over at my sister's place. On the agenda for that day? Couch tumbles. For those of you who may be uninitiated in the ways of living room acrobatics, couch tumbles are where you basically roll from the top of the couch down onto the floor. Great fun for adolescents, constant aggravations for parents. Yes, we've tried to stop him from doing these sort of things... but turn away from him for one second, and Keaton is right back to finding some other way to test the limits of his bones. Well, this time the tumble got the better of him. He caught a nasty bump to the mouth on his (now final) couch tumble. He reacted to the injury with his usual "at least it did not hurt me"... but you could tell it actually did hurt him. Keaton doesn't let any injury show, so it's sometimes really tough to gauge what requires attention and what doesn't. But when he winced during his nightly teeth brushing, we thought this one might be a little more serious. The next morning, I wake Keaton up to get him ready for the day and immediately go in to check out his front tooth. There was definitely some swelling, and again- wincing during the brushing. I said "buddy, I think this is one you can't just shake off... we gotta make a dentist appointment". Now here's the part where I wish certain traits weren't passed down to your kids. I hate doctors. I hate the dentist. I figure any injury that doesn't kill me, doesn't require a visit to a physician. Well, it looks like Keaton inherited that, because the mere mention of the word "dentist" caused him to straighten up and say "Dentist? I don't need to go to a dentist. My tooth is all better now, see?" and then he gave me his best clenched smile. I tried to explain that the dentist wasn't bad and that he might like the guy (knowing full well that this probably would be a pretty horrendous first visit). He wasn't having it. He again tried the "my tooth is fine now" whilst taking bites of his breakfast sandwich from the side of his mouth. I replied "sorry buddy... we gotta go. Your appointment is for tomorrow. The dentist really will make it all better". You could tell that really got him worried... and I knew that the things that would probably have to be done on this visit would lead to Keaton disliking the dentist from this point forward. What could I do? How could I make Keaton understand that the dentist isn't bad? Even though he was going to do things to Keats that would probably hurt... A LOT... it still was for his own good. 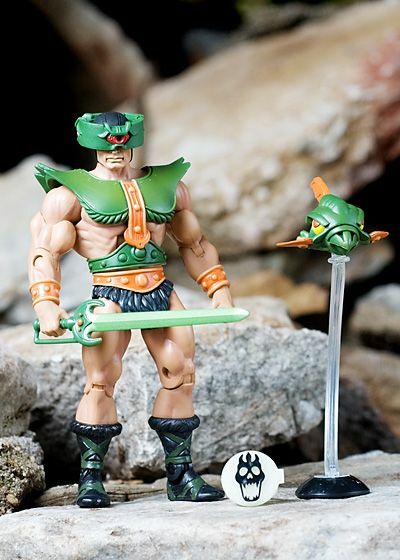 I had just received a Mo-Larr Vs Skeletor pack in my "Mad Matty Monday" package. Keaton had seen Mo-Larr amongst my figures before. He had remarked then that he was a "funny guy" and wondered why he didn't have him yet, not knowing that I found the figure fairly lame and had only bought them due to a cursed completest compulsion. He hadn't been around for the MMM pack arrival, so he didn't know that there was a fresh, unopened set sitting right downstairs awaiting a use. So I ran down, scooped up the pack and presented it to Keaton. Keaton: "Hey... it's the funny guy pack!" Me: "Yeah... but you know what else he is? He's a dentist!" Keaton: "Really? 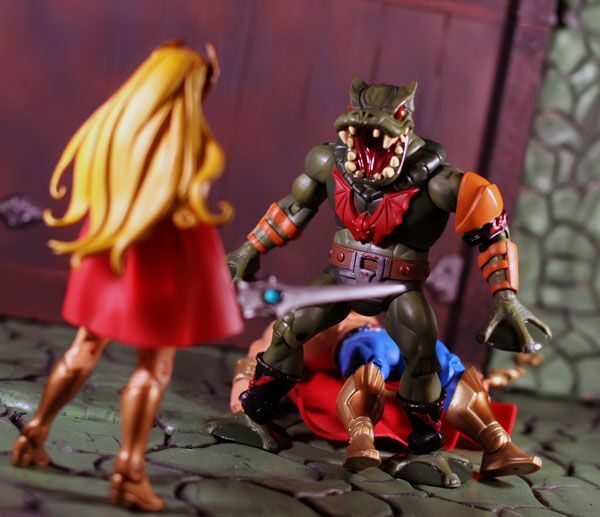 There's a He-Man dentist guy!?" Me: "Yes, yes there is. 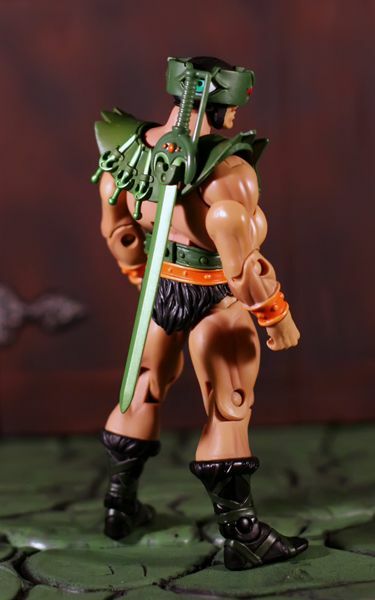 His name is Mo-Larr, and he helps all the people of Eternia with their teeth problems... 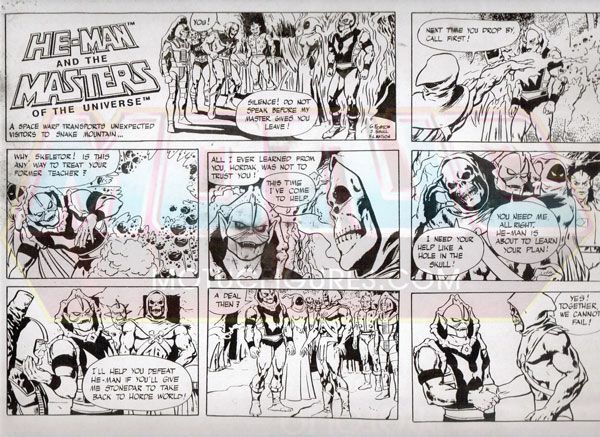 Even the bad guys like Skeletor! See? 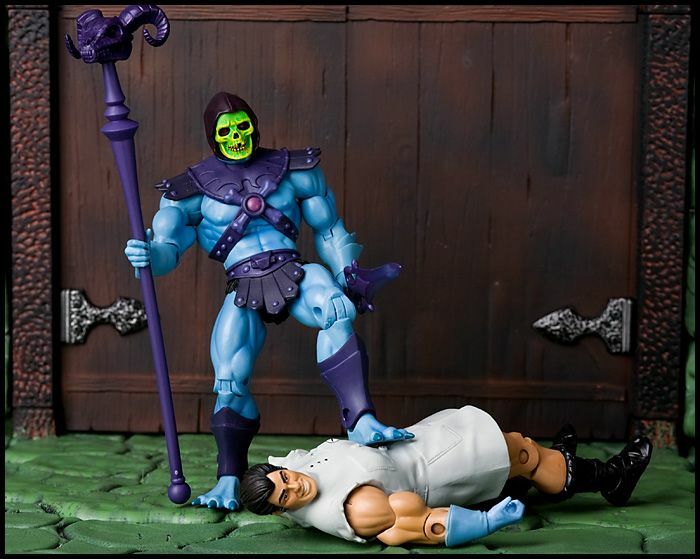 Skeletor had a hurt tooth just like you, so Mo-Larr helped him get it out so he could feel better. 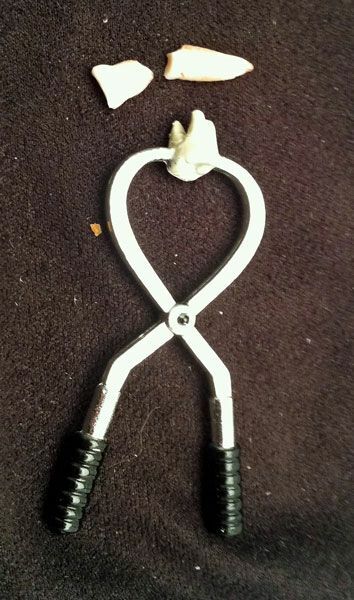 And if you go to the dentist, he'll help you too... and I'll give you this pack to take with you." That was it. He was sold. Not only was he willing to go, but he was actually EXCITED to go. The entire time we spent in the waiting room, Keaton played with those two figures, making Mo-Larr use each of his tools to help fix Skeletor's hurt tooth. By the time we got back to see the dentist, Keaton knew exactly what to expect when he hit that chair. Not only that, but he was able to explain what each tool did to the dentist before he even used them. 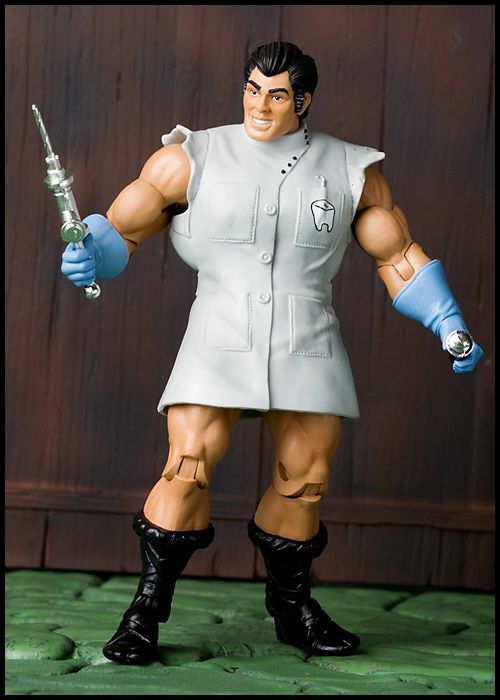 The dentist was floored... not only by the fact that he knew all this before ever having been to see a dentist, but also that there was a He-Man figure based on a dentist! After taking x-rays, the dentist explained that the tooth was majorly fractured and would have to be removed. I figured that's when it would hit home for Keaton that this wasn't going to be a fun trip. 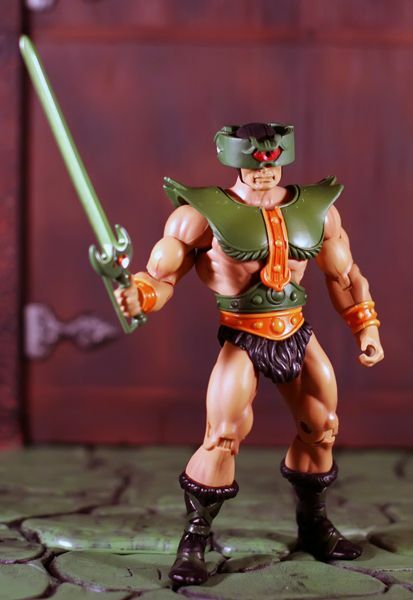 But he took it in stride, saying that he "would be just like Skeletor now". A couple shots of novocaine, some major yanking back and forth, and the tooth was out. Well, half out. The crack caused the root to stay behind. What followed wasn't pretty... but Keaton kept a stiff upper lip, clutching onto Mo-Larr and toothless Skelly with all the force 4-year-old mitts can muster. When it was all said and done, not a single tear was shed. 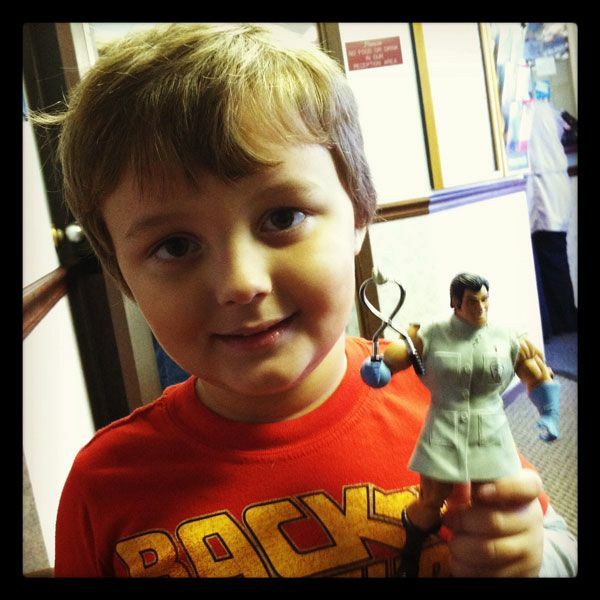 Almost unbelievably, Keaton left the office with a smile on his face (though it was lessened by one tooth), happy to come back to the dentist whenever it comes up again... because he knows that Mo-Larr will be there right along with him. 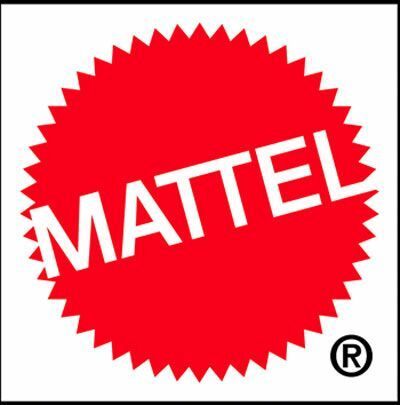 I know from my own childhood experiences that having a toy beside you during strenuous times can form a lasting bond with that lifeless piece of plastic. I have no doubt that this will be the same with Keaton. As much as I may not like him, Mo-Larr will probably end up being one of his favorites in the line thanks to their shared experience. 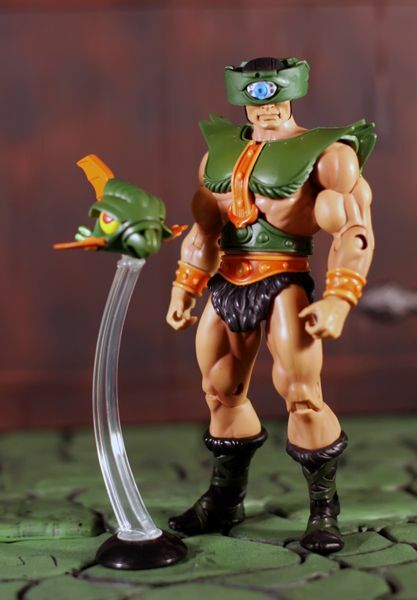 So to Toy Guru, Seth Green, and all the folks that made the Mo-Larr Vs Skeletor pack happen- My most heartfelt thanks and humble apology for my previous derision of this set. 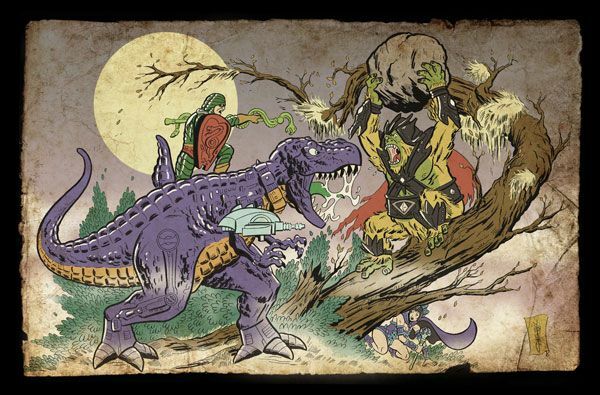 Today, He-Man took the day off... and Mo-Larr stepped up to the plate. 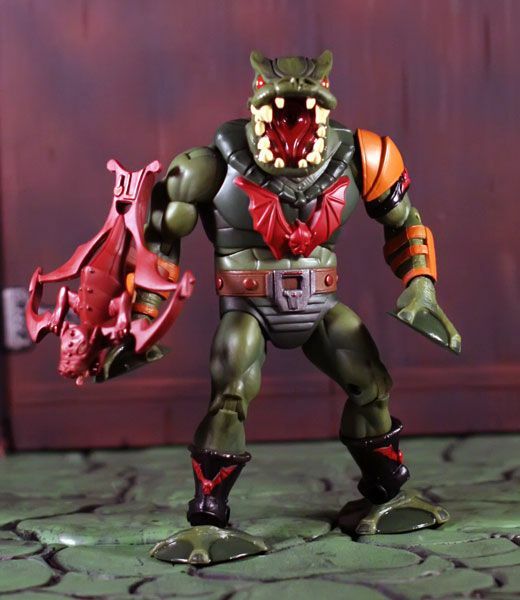 Originally an inter-dimensional bounty hunter and tracker, Scope was recruited by Skeletor during one of the final battles of the Great Unrest to bolster his weakened forces. 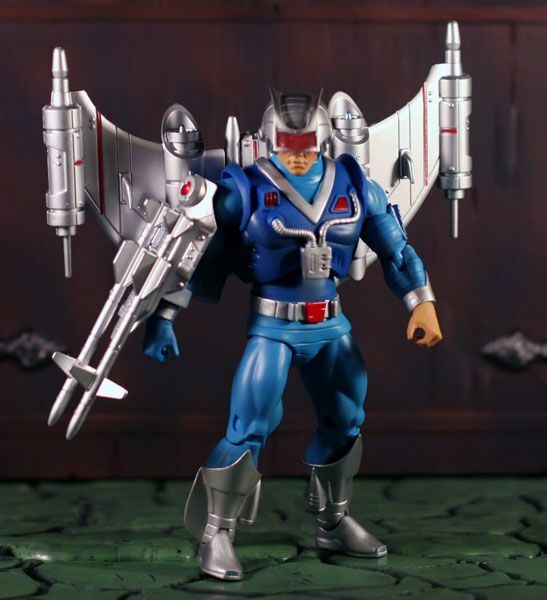 As good with a blade as he is crafty, Scope took the name Tri-Klops after an accident left him blind and he was forced to wear a tri-optic visor which granted him expanded tracking abilities including Gammavision, the ability to see around objects, Distavision, a form of Far Vision, Night Vision, and the ability to generate optic blasts. 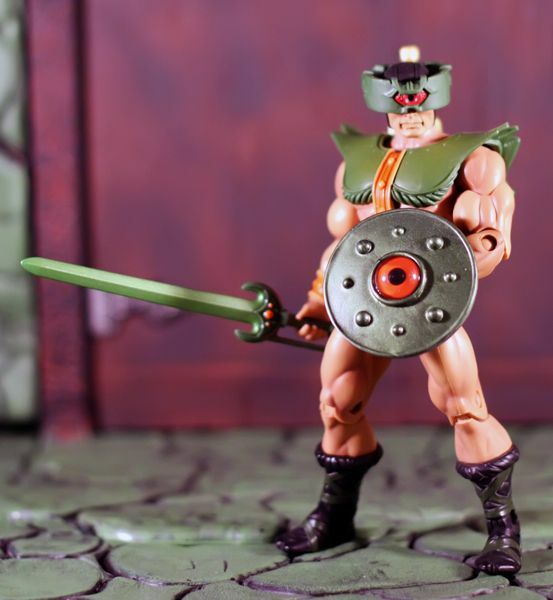 Tri-Klops uses his three different eyes to spy for Skeletor!